Harbinger Primary School is extremely passionate about their EYFS practise and needed a space that better matched their ambition and ethos. With the school looking to expand by taking children from the age of 3, they needed to improve their outdoor provision and playground as it was beginning to look tired and uninspiring. The outdoor area was taken up by planters that weren’t stimulating the children’s learning and gave them limited opportunities to expand on the curriculum. 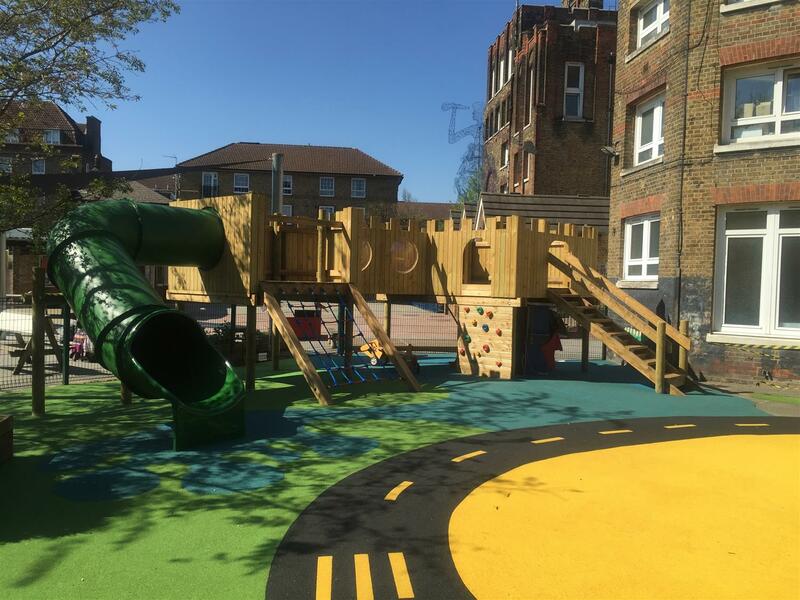 The playground also contained an old tower unit that was no longer challenging enough for the children and with its ageing frame, didn’t excite or motivate the children to climb and partake in physical activity. Another major issue was the uneven surface and the fact that none of the children had the space to self-select whilst outside. With the space offering little challenge or space for the children, it was hard for the teachers to set up an engaging learning environment and when they did, it took a longer amount of time than necessary. We needed to bring this EYFS space to life but most importantly, it needed a central piece that would amaze the children and get them excited about being outdoors. With children used to their old climbing frame that offered little to the imagination, we decided to create a structure that would not only offer physical opportunities but would inspire imaginative and child-led play. Harbinger primary School, we present to you, your very own bespoke Harbinger Castle! The Castle offers plenty of opportunity for physical play as children can access the castle via climbing walls and nets. The space on top of the castle is huge and is a great haven for child-led games… what fairy tales will they re-enact when on top of their castle? There is also opportunities for den-making underneath the castle structure which are great for reading activities, imaginative games or even quiet time. Our play enthusiast and EYFS expert, Sam Flatman, worked with Harbinger to create this flourishing Early Years Learning environment. You can watch him walk, climb and slide his way around the new playground. 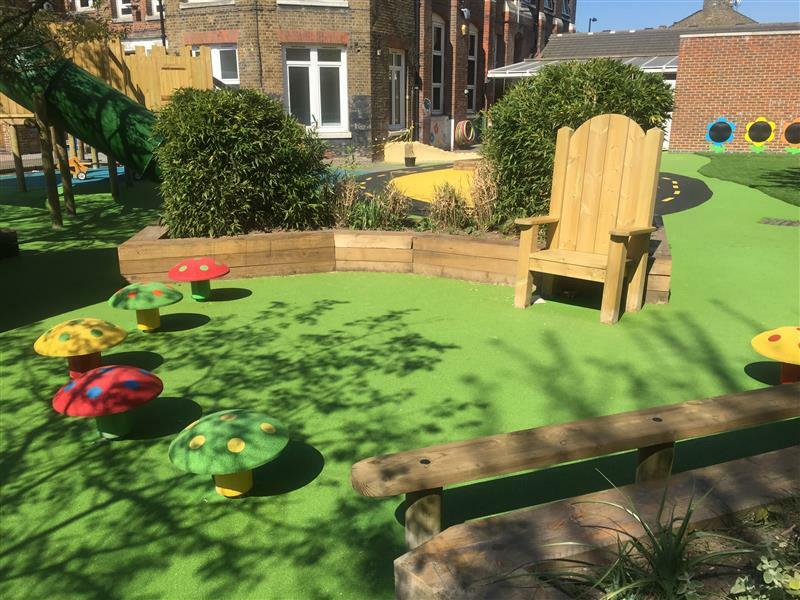 With old planters offering minimal sensory simulation we decided to install bespoke flow puddles that offer children the sensory experience of water play, physical development and PSED. The flow puddles also harness the potential to support lessons that include understanding gravity, how water flows and being able to manipulate the flow of water. 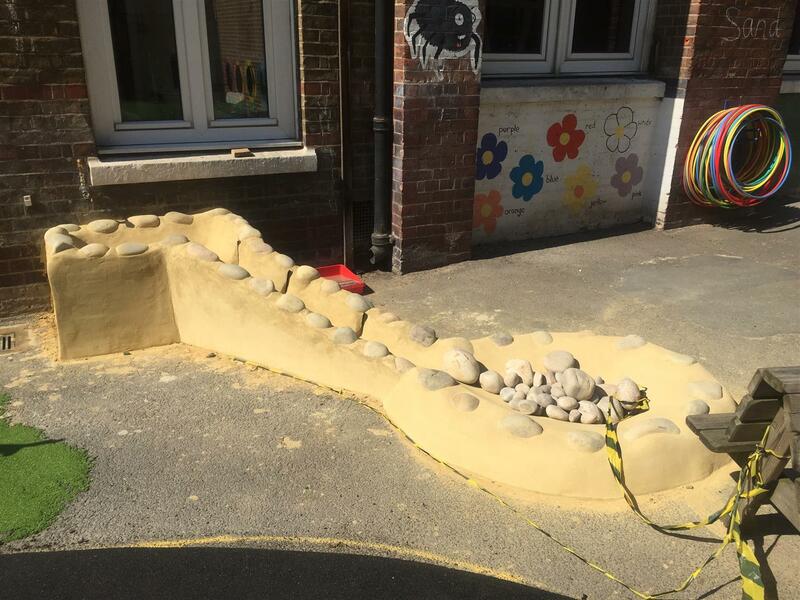 To make a better use of the limited amount of space, we creatively used Wetpour to emulate a roadway so that the children could practise road awareness using their bikes and trikes. 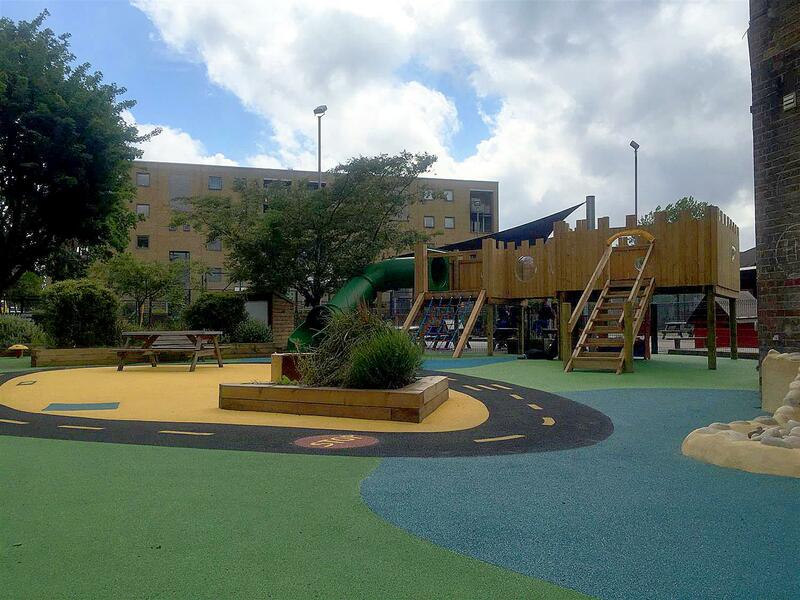 This is also a fantastic way to get children active especially when the space is limited, the roadway adds a create edge that will engage the children further. As the EYFS curriculum states that children must learn 0-20, we again used Wetpour and Playground Markings to create a fun and engaging way for children to learn 0-20 on the playground surface. We created a pattern from the numbers that children could either hop along or use bean bags or markers to practise number recognition. We added a Story Telling Circle for children to practise their Communication and Language and be inspired by Literacy. Children can now enjoy gathering around the chair to listen to their favourite fairy tale, story or poem. They can also take it in turns being the story teller which will enhance their speaking and confidence in front of their classmates. Our Mud Kitchen was installed for more messy play and child-led opportunities. This EYFS resource naturally develops PSED, Communication and Language and children’s Understanding of The World as they work in teams to create scrumptious mud pies, cakes and whatever their imagination thinks of. We wanted the teachers to be able to set up their environment with ease, so we added a Large Storage Unit to place all their learning resources in one place. It’s also a good way to teach children about the importance of cleaning up after themselves. 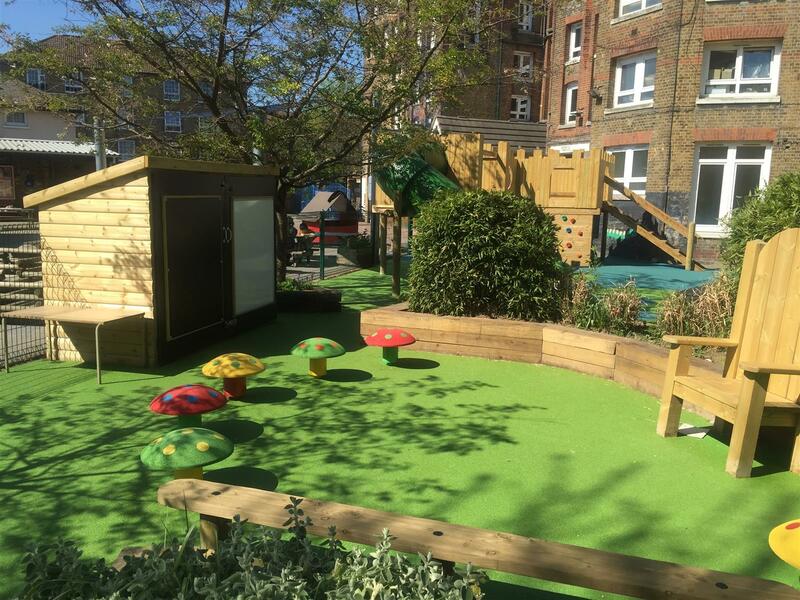 Are you looking to enable your Early Years Outdoor Environment? 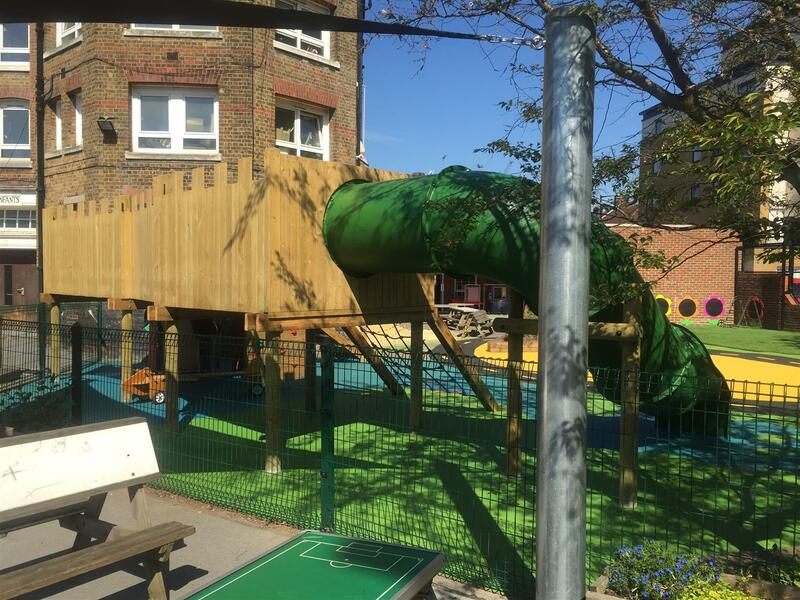 We have been in the industry since 1998 and have worked on some incredible EYFS Projects. If you'd like to learn more, Contact Us through the website as we love discussing new ideas to improve the lives and learning of children.